Andy Murray is the 2016 Sports Journalists’ Association Sportsman of the Year. Cyclist Laura Kenny (formerly Trott) is Sportswoman of the Year while the British women’s hockey team are the SJA Team of the Year. Murray overwhelmingly topped the SJA members’ vote ahead of Olympic gold medallists, cyclist Jason Kenny and gymnast Max Whitlock. Kenny, the first cyclist to win the Sportswoman of the Year award since Victoria Pendleton in 2007, finished ahead of boxer Nicola Adams and dressage star Charlotte Dujardin. Our Olympic hockey gold medallists pushed the unbeaten England men’s rugby union team into second with rowers Helen Glover and Heather Stanning in third. The National Lottery is in its fifth year of sponsoring the SJA awards event. It plays a unique role in supporting the country’s elite athletes, with 700 Olympic and Paralympic medals having been won since Lottery funding was first awarded to elite athletes in 1997. The National Lottery has also invested over £5 billion in grassroots sport to date, supporting more than 150 different sports and creating opportunities for everyone to get fit. 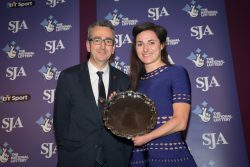 Their Spirit of Sport Award went to Britain’s most successful woman Paralympian, Dame Sarah Storey.